The journey begins. And I can’t help but feel giddy. Like millions of Netflix Chef’s Table fans, I fell in love with the story of chef Massimo Bottura and his quest to challenge the perception of Italian cooking by opening Osteria Francescana in 1995. After years of trying to win over a traditional town that didn’t accept—or attempt to understand—his vision, the tables turned. In 2016, Osteria Francescana was named the best restaurant in the world by World's 50 Best Restaurants. The Chef's Table episode was gripping; equally because of Massimo’s exquisite, modern depictions of authentic Italian dishes, and for the love story between him and his wife, Lara, and the intertwined restaurant and family they built together. About a year later—after much planning and getting extremely lucky with a reservation—I was on my way to Modena to dine at the three-Michelin-starred ristorante from Italy’s most distinguished chef. Expectations were high, to say the least. Modena is a charming town in the heart of the Emilia-Romagna region in northern Italy. A stroll down the narrow cobblestone streets reveals ancient medieval architecture, quaint shops and many acetaia producing the city’s famous balsamic vinegar. I arrived at Via Stella 22, a salmon-pink building with an unassuming facade and a modest metallic nameplate: Osteria Francescana. A handful of eager patrons showed up outside, taking the obligatory photo in front of the sign. At precisely 12:30 p.m., the grey door opened. “Buongiorno!,” greeted several well-appointed hosts in the restaurant’s foyer. We were welcomed in. Tucked behind the door is a shockingly life-like statue of a security guard that catches my eye. It takes me a second to realize he's not real. (Bottura later explained that the guard, named “Frankie,” was crafted of solid bronze by American artist Duane Hanson.) After being escorted into one of the two dining rooms, my husband and I were seated at one of only five round tables. Plush carpet lined the floor, and the light turquoise-colored walls were studded with modern works of art. Lighting was soft; the atmosphere, noticeably calm. Within moments, a Brut Blanc de Blancs was bubbling in my glass as I perused the à la carte and tasting menus. We quickly decide on the Tutto, which means "everything:" a twelve-course succession of classic signatures, along with some newer dishes. 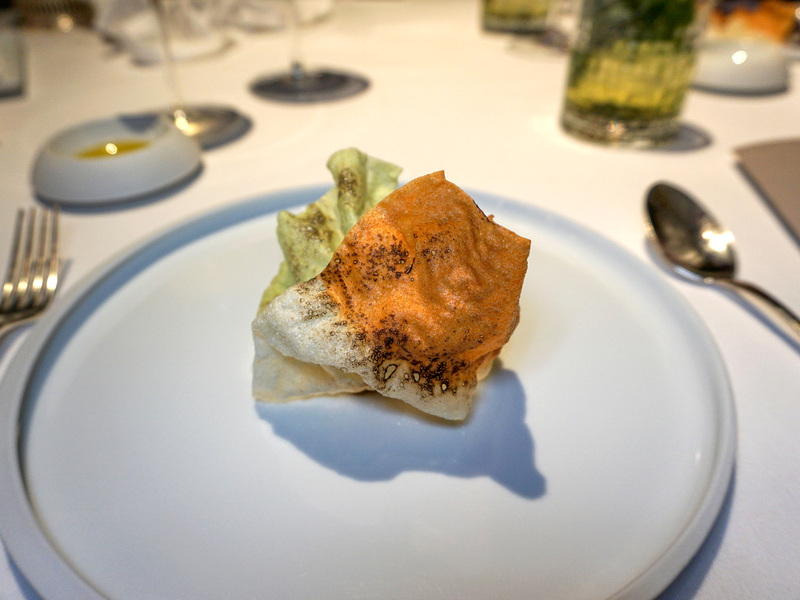 Shortly after starters were presented, Bottura appeared. With his signature dark-rimmed glasses, white chef coat and the warmest smile, the modern gastronomic icon was refreshingly humble and genuine, while exuding powerful waves of charisma and unbridled passion for his craft. Service, of course, was a well-orchestrated symphony. Every dish played with your palate and teased multiple senses. I was, in the most matter-of-fact sense, eating edible art: a collection of personal memories and emotions. 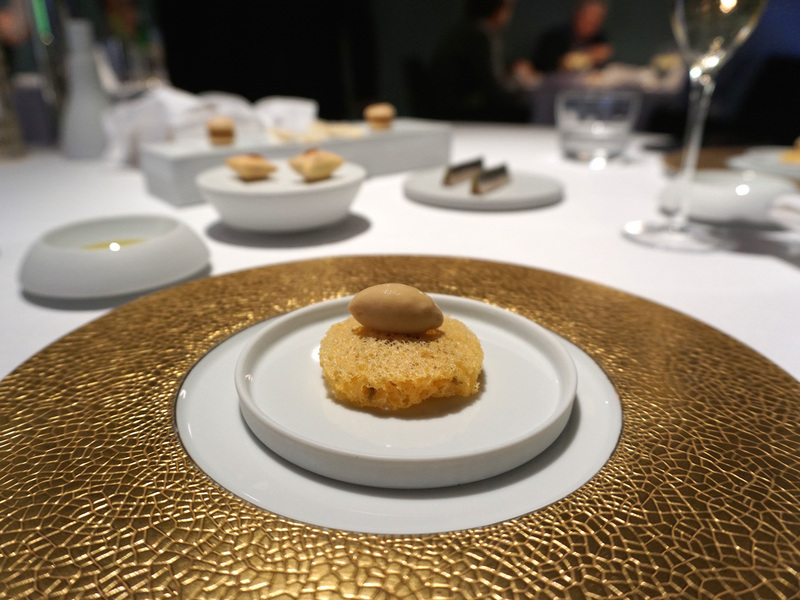 Bottura’s vehicle for storytelling was meticulously manipulated ingredients—many foamed, dehydrated, crisped, cracked, smoked and stylized—that worked together in harmony. Take "The Crunchy Part of Lasagne," a futuristic-looking interpretation of one of his fondest childhood memories. Bottura shared, “When my mother would pull the tray of lasagne out from the oven, and me and my brothers would crowd around the kitchen counter fighting over the burned corners of the pan—it’s the best part!” To recreate that moment, a thin sheet of tri-colored pasta is fried and toasted until crisp; it rests above a traditional, hand-cut meat ragù layered with creamy béchamel. Then there is "Autumn in New York," a savory-sweet-umami ode to the fall produce Bottura found at New York’s famed Union Square Greenmarket. The show-stopping "Five Ages of Parmigiano Reggiano in Different Textures and Temperatures" delivered different sensory experiences from a single ingredient. 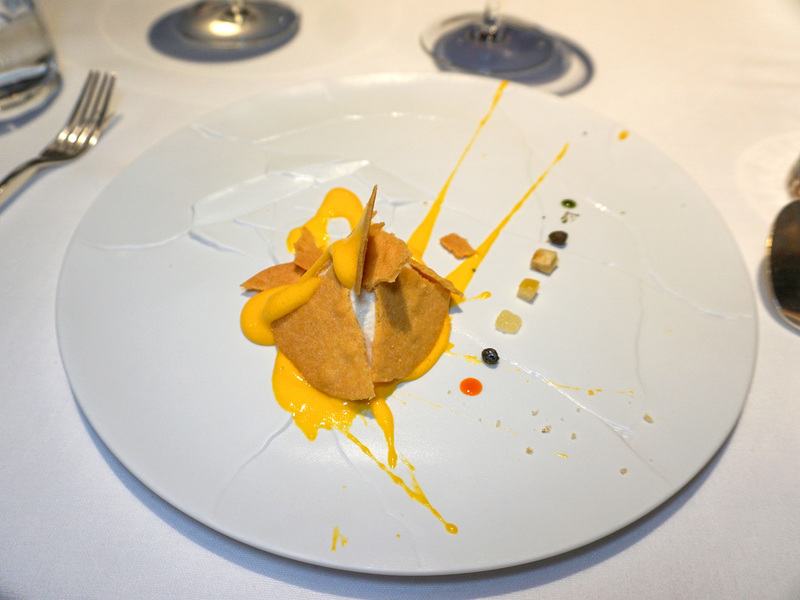 Five distinct ages of Parmigiano (from 24 to 50 months) are transformed into a sauce, an “air,” a foam, a soufflé and a crispy galette; the dish took Bottura years to perfect. The region’s prized formaggio also shines by way of tiny, precisely-shaped tortellini coated in luscious Parmigiano cream and covered with white truffle shavings. This meal was as decadent as it was transcendent. Eating emotions never felt so good. During dessert, Bottura’s wife, Lara, warmly greeted us. We chatted about the couple’s Food For Soul charity initiative and their latest undertaking. Francescana helped put Modena on the map, and diners travel from all over the world to eat there, yet the tiny town has limited accommodation options. “When Robert De Niro comes to eat here, there’s really nowhere he can stay,” explained Bottura. So he and Lara are aiming to fix that; they're opening a small relais just outside Modena in a restored 17th-century villa, in late 2018 or 2019. The property, complete with gardens, a man-made lake and tennis courts, will be named Villa Luisa, after Bottura’s mother. The duo even hinted about upcoming restaurant projects—not necessarily fine dining like Francescana, but no doubt pushing boundaries and blurring the lines between food and art, as only a chef who cooks with his emotions on his sleeve knows how to do.